Betty Ensor Thomas ..... In our quest to find the Best Products to help keep your feet healthy and happy we came across Citrusway® Products. Citrusway® was created out of the idea to bring safe and natural nail fungus and skin products to their customers. Their products aim to superior results without the use of chemicals or toxic drugs. Their products are Gluten Free, Fragrance Free, and contain no preservatives or paraben. Their Number 1 Product and the Foundation of their line is their Citrusway® Nail Solutions. This product targets damaged, lifted, discolored finger and toe nails.Their proprietary formula asphyxiating properties makes it highly effective for the majority of nail damage issues. This product is Diabetic and Vegan Friendly. Citrusway® Foot Refresh Foot Spray is a natural formulation that helps revitalize damaged skin and generates the look and feel of hydration without the slip of creams of lotions. Citrusway® Foot Refresh Foot Spray will help revitalize damaged skin and imperfections for an attractive and more beautiful appearance. This product is also Diabetic and Vegan Friendly. Citrusway® Hydrating Foot Lotion is a hydrating formula enriched with a natural citrus extract to soften, smooth, and revitalize rough, damaged skin. Long lasting with deep hydration. It is perfect for extreme conditions and dehydration that is common in airplane travel. Paraben free. These products have been tested and approved by our employees. Come by and try some from our Sampler today. You will be impressed. I have been wearing Thorlo's Walking Socks since we started in business back in 1993. Any other sock that I have put on my feet since then have never ever came close to the comfort and support that I get from my Thorlo's. That means that there are no other brand socks in my sock drawer. on a pair. Once you have one on you can easily see that these are not ordinary socks at all. I could write a Chapter on why these socks are so special, but I will try to keep this as short as I can. low profile toe seam.They are also cushioned under the heel and the back of the heel. There is spandex in the arch area (it's like have arch support in a sock). THOR-LON® fibers that are soft, resilent, durable and moisture-wicking to keep your feet drier. THORLO® states that these socks are "designed for feet that hurt." I absolutely agree with that statement but will add that these socks are also designed for people people that do not want their feet to hurt. IF you have problem feet, IF you health walk, IF you walk on the job all day, or IF you stand all day - theses socks are exactly what you need. 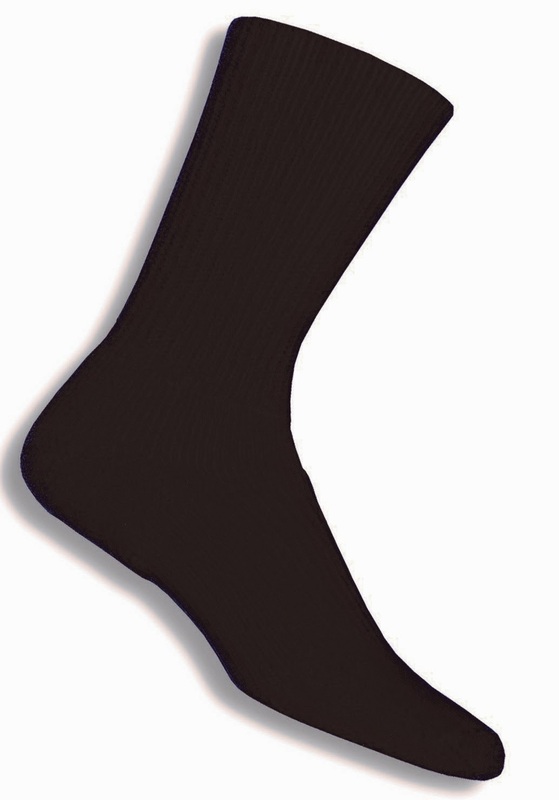 The unique padding in these socks are clinically shown to reduce blisters, pain, pressures, and moisture. I promise that these are the most comfortable socks on the planet. Betty Ensor Thomas ..... This is probably my first blog that doesn't have to do with shoes or feet specifically, BUT this is a product that I am sold on. I am sold on it so much that I wanted to carry in our store. Little did I know that this product is actually produced in Tennessee. I was introduced to Willow Balm by a customer several months ago while I was complaining about my knees aching (which they do occasionally). She pulled a tube out of her purse and made me try it right then and there. in my knees. The fact that it is all natural and does not have an overpowering odor was a definite plus. When you read the back of the tube you will see ingredients that you know and can pronounce. Words like Jojoba, Menthol, Camphor, White Willow Bark, Eucalyptus, Geranium, Lavender and Spearmint. Never again will you have to waste money on greasy, smelly Topical Painkillers. Willow Balm is a "must have" in your arsenal against pain. Betty Ensor Thomas ..... One thing that we have been asked for over and over is 100% Cotton Socks. Some just want the comfort of a thin Cotton Sock, others need the no elastic feature, and others because they are diabetic. Well, we have them now. Wearever ® is now producing the Buster Brown® Brand of 100% Cotton Socks. There is no elastic or any synthetics in these socks at all. All you get is the natural ease and comfort of 100% cotton. Betty Ensor Thomas ..... It my absolute pleasure to introduce you to AVA which is a new style in the Daniel Green® Clean Comfort™ line. The Clean Comfort™ slippers are designed to pamper you in your very own home. It is a spa collection make with soft terry cloth and foam cushion. AVA comes with adjustable Velcro strap, an Indoor/Outdoor Sole, and is Machine Washable. are available by Special Order). Betty Ensor Thomas ..... L.B Evans is clearly the leader in Men's House Slippers. Klondike is one of their top selling styles. Keep your footsies warm in the wonderful contemporary slip-on style slipper. This slipper has a wonderful blend of features that include a warm acrylic boa lining that is formulated to mimic the feel of sheepskin. It repels moisture and is non-allergenic. 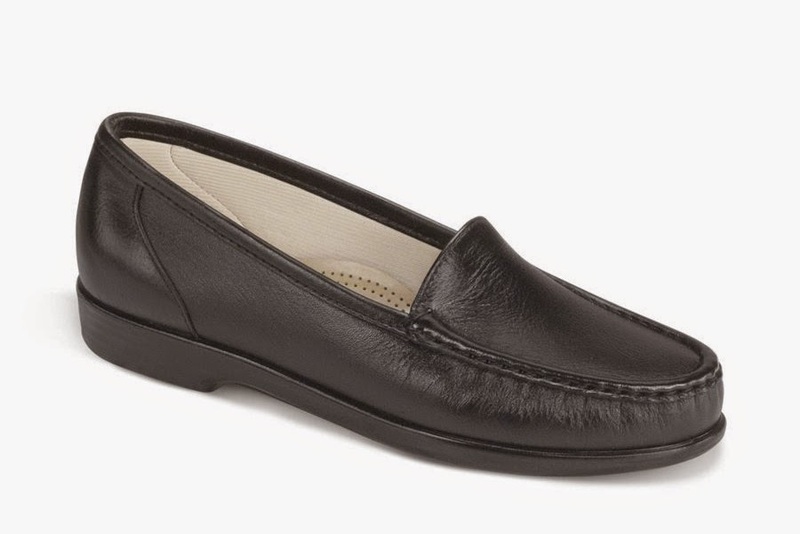 The upper is genuine suede leather with a leather trim collar with subtle elastic side panels, and pulll tabs make this easy to slip on. The sole is slip-resistant, and this can be worn inside and/or outside. Betty Ensor Thomas ..... The Meg Slipper continues to be one of Daniel Greens most popular sellers of all their styles. It has a Customer Review of 5 Stars. Meg is for casual wear around the house. This style is easy to wear and hard to decide to take off. Meg has a 3/4-inch lift in the heel and a full length insole that is padded with foam. It is lined with a lightweight, breathable Tricot fabric. With attractive detail stitch and soft leather upper, this style will be hard to have in just one color. Please stop by and try this little gem of a House Slipper on. Betty Ensor Thomas ..... L.B Evans is clearly the leader in Men's House Slippers. ATLIN is one of their top selling styles. Keep your footsies warm in the wonderful contemporary moccasin style slipper. 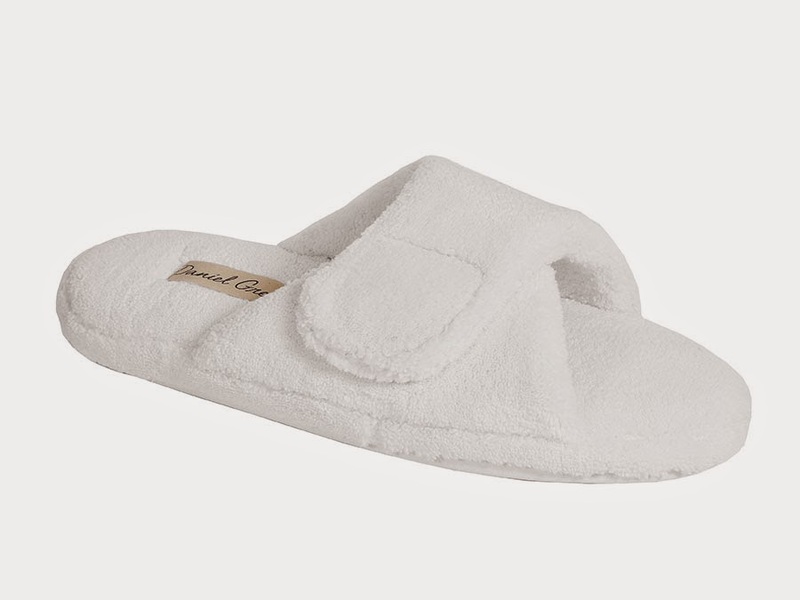 This slipper has a wonderful blend of features that include a warm acrylic boa lining that is formulated to mimic the feel of sheepskin. It repels moisture and is non-allergenic. The upper is genuine suede leather with a leather collar and rawhide lacing. The sole is slip-resistant, and this can be worn inside and/or outside. *Sizes 17 and 18 are available in Saddle Only. Betty Ensor Thomas ..... 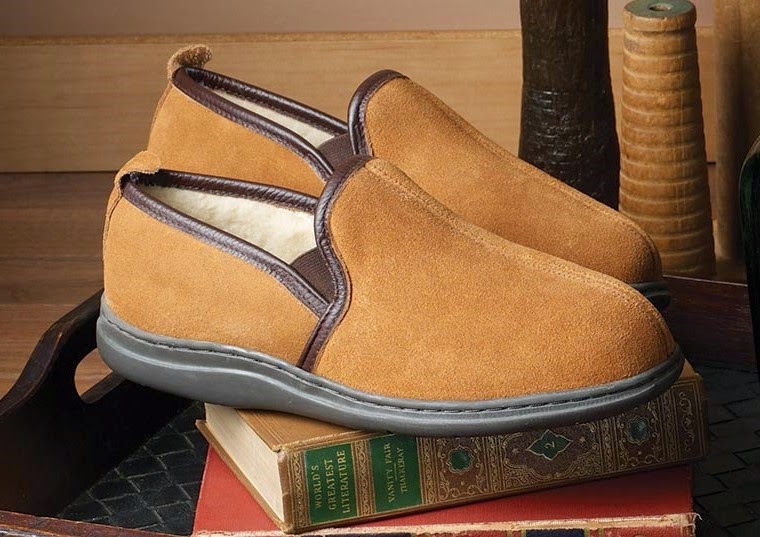 The Dormie Slipper continues to be Daniel Greens most popular sellers of all their styles. It has a Customer Review of 5 Stars. Dormie is an open-toe slide design with a full inch heel made of soft, comfortable faux leather or fabric upper. 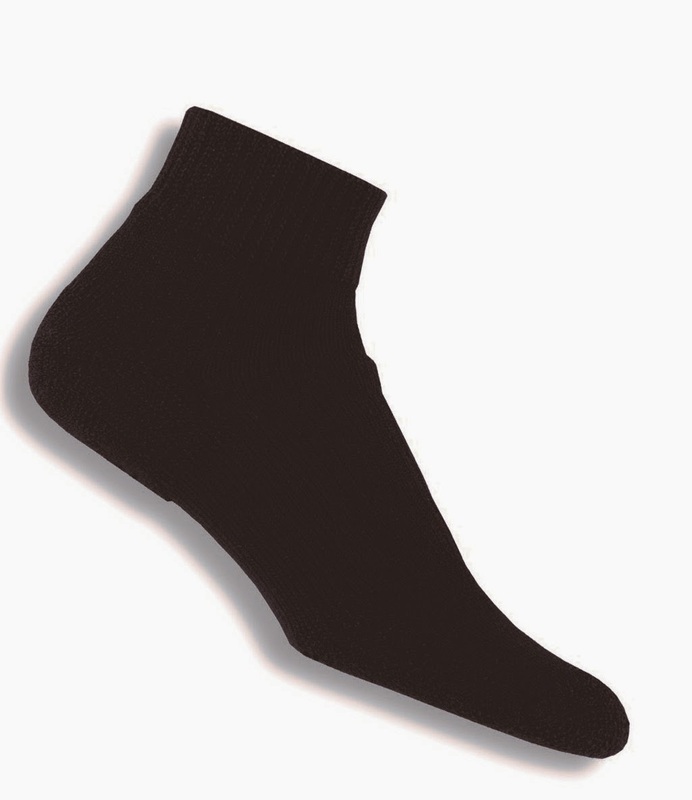 It has a soft lining and a foam padded comfort sock that provide lasting comfort. With an Indoor/Outdoor durable and lightweight sole you can literally where this House Slipper anywhere. Betty Ensor Thomas ..... Originally this style came out and was named Simple, and I loved that name. We would always say that it was "simple" enough to dress up, and "simple" enough to dress down. Later they made a few tweeks to it and renamed it Simplify and we still say the same thing, because it is still true. This has been one of the Top Selling slip-on styles from SAS®. Simplify is designed to fit and mold to the shape of the foot. With True Moccasin Construction the soft and supple leather completely wraps around the foot. This style has an SAS® Comfort Foot Bed with a Contoured Arch Cushion. SAS Tripad® Cushions cushion the main pressure points of the foot. 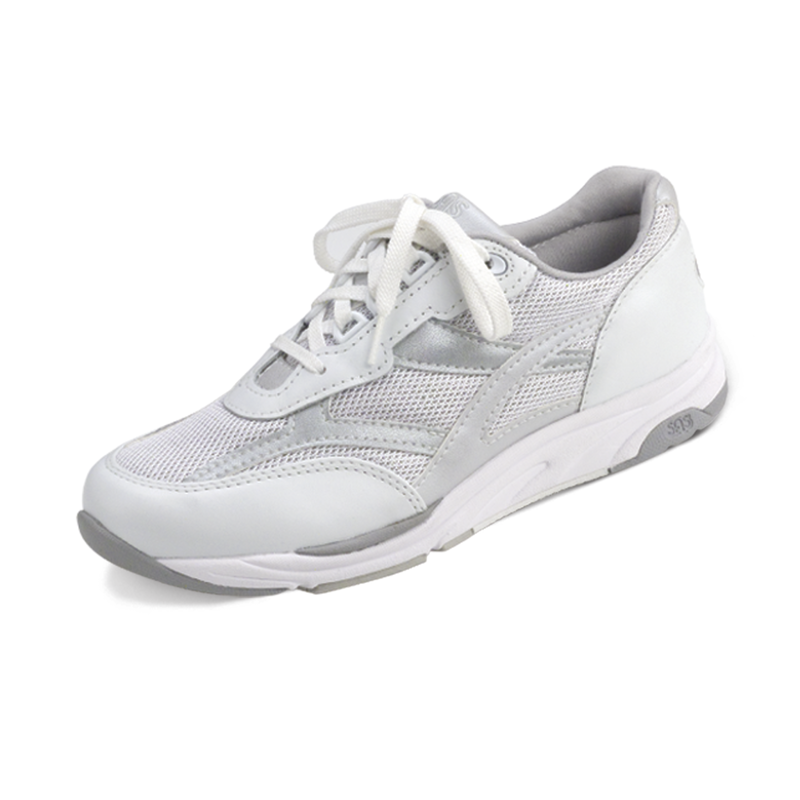 This shoe is lined with a Foam Cushioned Tricot Lining, and has a Supportive Heel Counter to cradle the heel. It is completed with a Soft Flexible Polyurethane Sole that contains millions of tiny air bubbles, and a Soft Step™ Heel that has a wide base for extra stability. Black, Red, Wine, Black Croc, and Brown Croc. Be on the lookout for some Special Colors. Betty Ensor Thomas ..... Easier is a gem of a shoe, and I would not have believed it until I actually got a pair. Easier is designed to fit and mold to the shape of the foot, and has extra toe room. 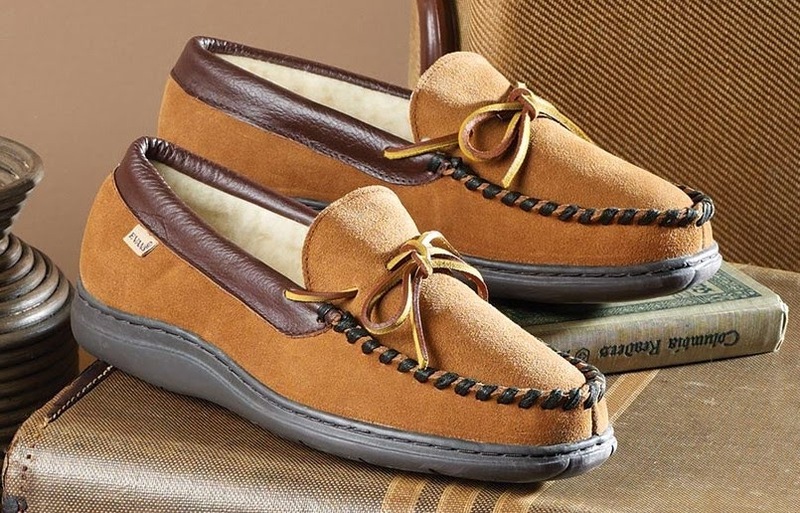 The genuine moccasin construction wraps the soft supple leather completely around the foot. Easier comes with a firm heel counter and a soft padded collar. It has an elastic gore that stretches and relaxes with the movement of the foot. Easier comes with a full length cushioned foot bed with a cushioned arch, the Green SAS Odor-Resistant Tripad® Cushions under the ball of the foot and heel. With it's wide base heel and the New SAS Shock-Absorbing Soft Step Wedge Heel, there is maximum comfort in every single step. Easier is available in Black and Wine. Stop in, have your feet measured, and try on a pair of this little gem of a shoe. Betty Ensor Thomas ..... 'Bout Time is our Number 2 selling SAS® style for Men, and I can not believe that I have not written about this great style before now. 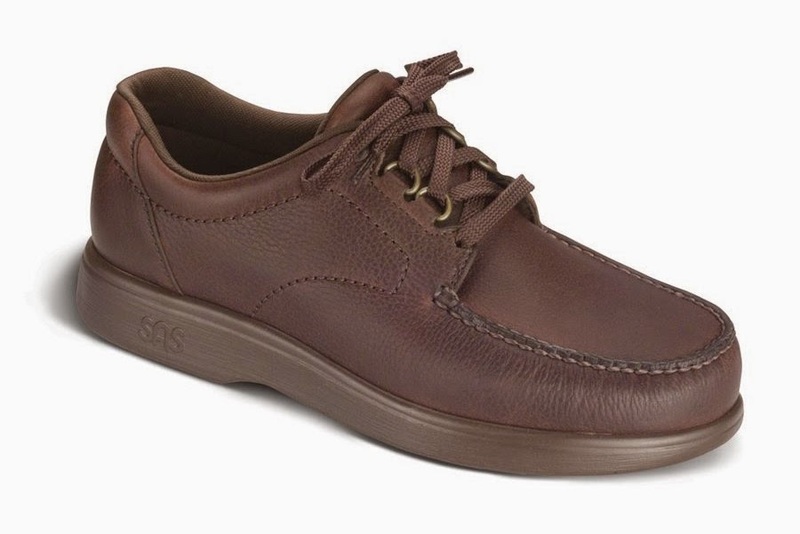 As you can see this great style can be used for either Casual Wear or as a Dress Shoe. 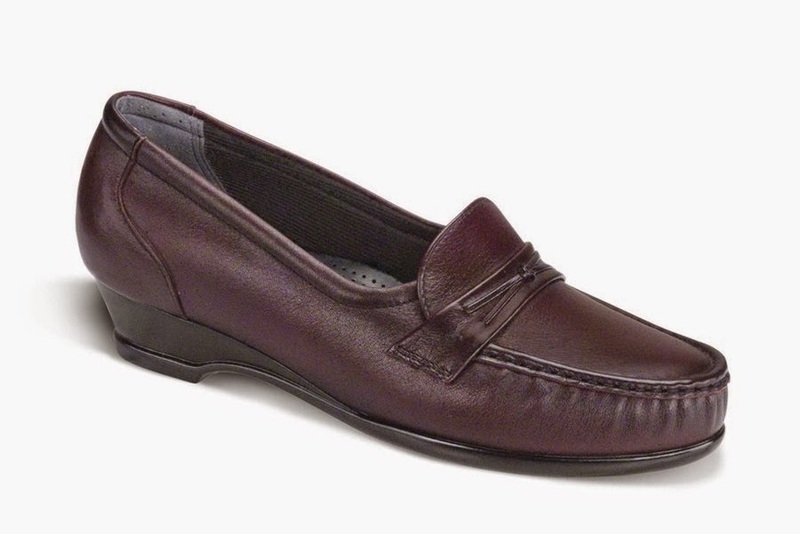 The genuine moccasin construction of this style wraps the finest soft supple leather completely around the foot. 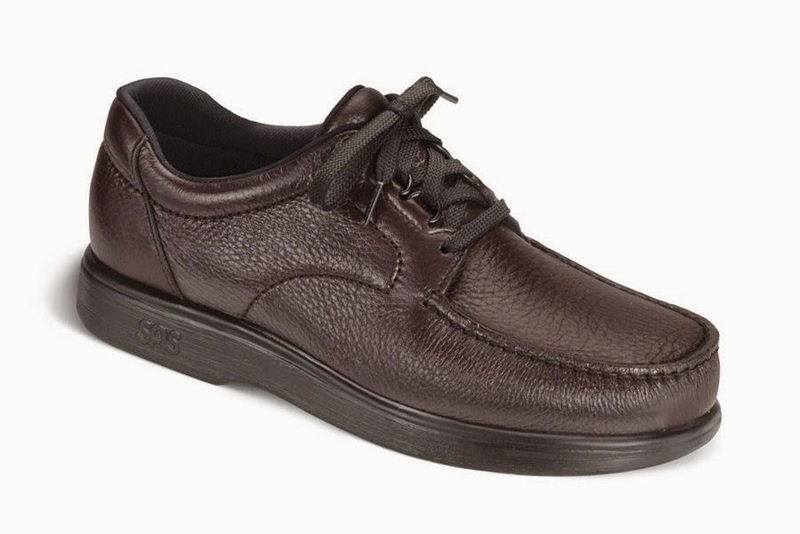 With it's soft leather, soft linings, broad toe, deeper toe, and extra depth 'Bout Time is one of the SAS® Styles that is Medicare Approved for diabetics. 'Bout Time comes with all of the SAS® Bells and Whistles. Those include the SAS Selfset® Foot Bed, the SAS Tripad-Moc™ Construction, the Soft Step™ Heel, and the Lightweight Flexible SAS Supersoft® Sole. Add in the padded tongue and collar, the firm heel counter, and the EZ Lace™ System and the package is complete. Drop by, have your feet measured, and try on a pair of these incredible shoes.